Though powdered alcohol has been approved for sale by the federal tax and trade authority, many state and some federal legislators are alarmed – and are seeking to ban the product before it ever hits the shelves. Earlier this week, the US Alcohol and Tobacco Tax and Trade Bureau (TTB) approved the sale of 'Palcohol' in vodka, rum, cosmopolitan, and “powderita” flavors, with lemon drop still pending. In response, the Utah state legislature adopted a bill banning the product, while New York Senator Charles “Chuck” Schumer introduced a law that would ban it at the federal level. “Underage alcohol abuse is a growing epidemic with tragic consequences and powdered alcohol could exacerbate this,” Schumer (D-N.Y.) said in a statement introducing the 'Sober Truth on Preventing Underage Drinking Reauthorization Act' (STOP) legislation. Alaska, Colorado, Louisiana, Michigan, Minnesota, New Jersey, New York, Ohio, South Carolina and Vermont have already banned powdered alcohol or have pending legislation that would do so. Creator Mark Phillips says he designed the product for the convenience of travelers, and that industrial-grade Palcohol could have medical, manufacturing and energy applications. He dismissed arguments that powdered alcohol could be snorted, snuck into venues or used to “spike” someone’s drink as being impractical, due to the properties of the powder. 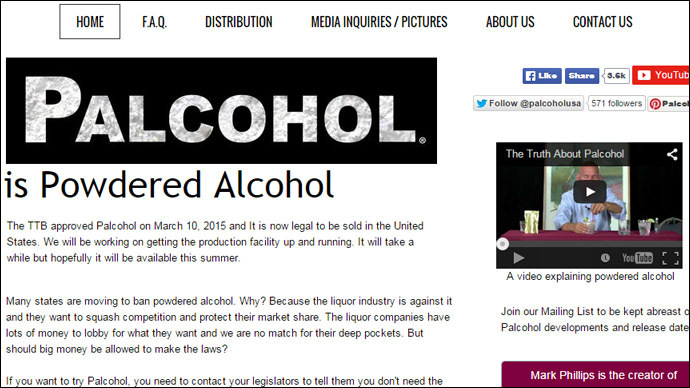 And since the powder would be subject to the same rules as liquid alcohol, it would remain illegal for sale to minors. The media furor over Palcohol’s approval prompted the US Food and Drug Administration (FDA) to issue a clarification Friday, saying that the authority to regulate alcohol lies with the Tax and Trade Bureau. “We did not provide an approval, nor did we conduct any testing,” the FDA said in the statement. The FDA also lacks authority to ban powdered caffeine, linked to at least two overdose deaths last year, since it is technically a food supplement. However, the agency has urged the public to refrain from using caffeine powder, since it is virtually impossible to determine the correct dosage by using common household measuring tools.